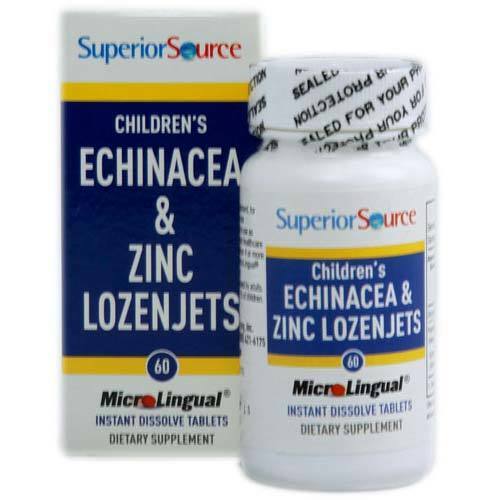 Superior Source Children's Echinacea and Zinc Lozenjets is a preservative free supplement choice. Warnings: Keep out of reach of children. Do not take more than recommended dosage. Consult healthcare provider before starting this or any other dietary supplement. Do not use if safety seal is broken or missing. Recommended Use: As a dietary supplement (herbal), for children less than 4 dissolve one MicroLingual tablet in meal or use as directed by your child's primary healthcare provider. For adults and children 4 years of age dissolve one MicroLingual tablet under the tongue daily. This product may also be swallowed by adults.